If you've been following my Instagram account and stories then you know what this blog post will be about. I recently had a chance to try a Radiofrequency treatment on my thighs courtesy of Big Day Slim Team. 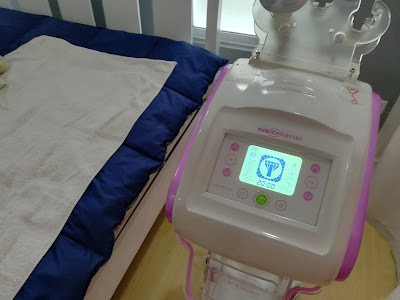 It's my first time trying out this kind of slimming treatment and I'm glad that I did! I did 2 sessions and my thighs are still recovering from the treatment but watch out cos I'll upload a separate vlog on my Youtube channel so that you can see how the treatment goes as well as my final thoughts on my whole experience. No worries, I'll still leave my overall review below. TBH, I've been trying my best to loose some weight, or at least try to eat healthy meal when I can. I just started "smoothing" or blending fruits and veggies using my mom's NutriBullet and I've been really enjoying it. However, I'm really lazy when it comes to doing some exercises, I just feel like I don't have the energy to do some squats cos running around the house with a two year old feels enough. 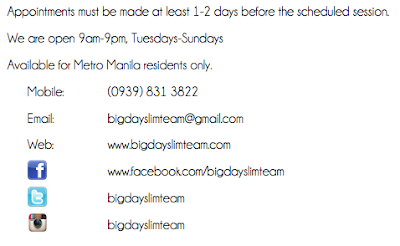 Now, let me introduce what Big Day Slim Team is all about as well as the services they offer, packages you can avail, and their price list. Big Day Slim Team is a group of dedicated people focused on helping you get the body you desire in time for your big day. We understand that fighting the bulge is no easy task, so we are here to make things a little easier for you. • Our Machines – our non-invasive slimming machines are of the latest technology and are handpicked from Korea to get the best results. 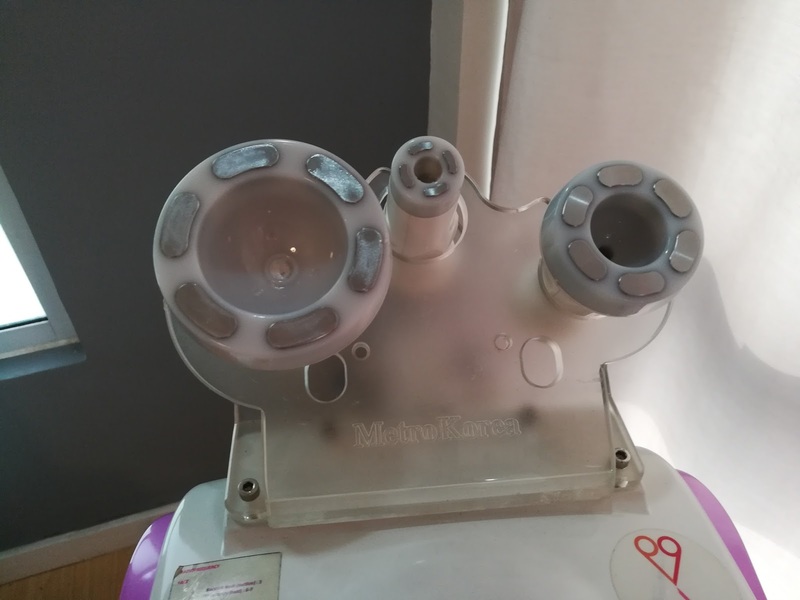 We use multiple paddle sizes, pulse frequencies and techniques to cater to specific problem areas such as the face and neck, arms, middle section and thighs—while considering your unique body type, lifestyle and Big Day deadline. • We go straight to you – no need to compromise your time for the gym or even your drive back home. We are a home-service team who can do a spa set up in the comfort of your own abode. After your session with us, feel free to relax and watch TV. Let us pack up and worry about the traffic while you enjoy the rest of your day at home. • Any additional area per treatment day will be given a P300 discount. • For packages of 6 with at least 2 body areas orders, an additional P300 off per session/ area will be discounted. • For maximum results, a minimum of 6 sessions (twice a week) is recommended. • We advise that your last slimming session be a minimum of 2 weeks before your Big Day deadline. 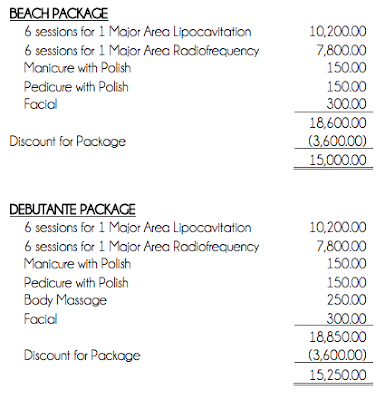 • Pampering services are only available as add-ons to at least one slimming treatment and must be acquired the same day. 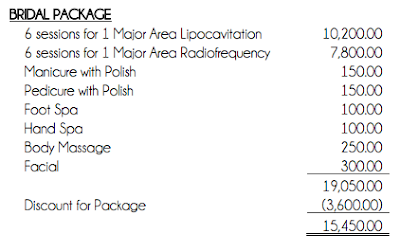 RF uses radiofrequency waves to melt fat and tighten skin. RF is warm in sensation due to RF waves emitted by the machine. 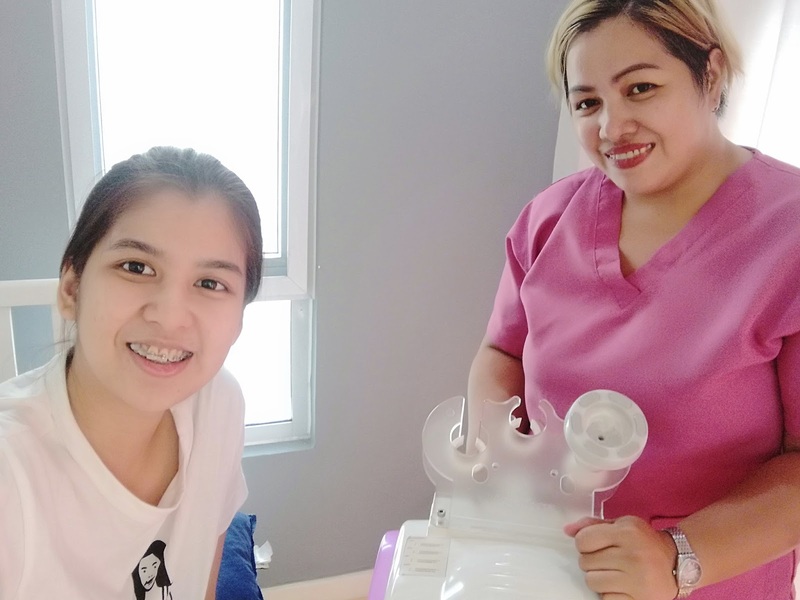 My first RF Thigh session with Ate Gina. During my first session, the feeling was really ticklish while being massaged by the paddle. The heat level was set to 2 and I didn't feel much pain. Just more on vibration and heat. However, a few minutes after my first session, it felt like I jogged miles or did squats as my thighs really felt so tight. 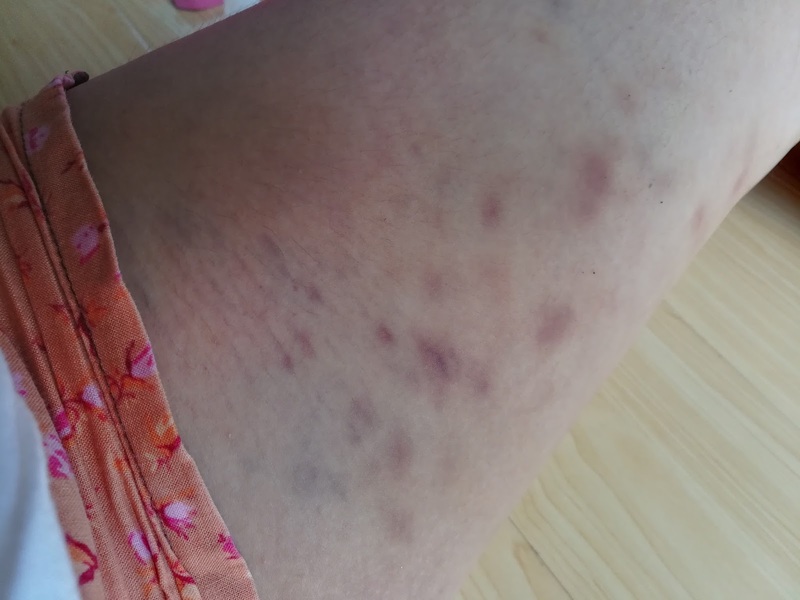 I also acquired some blurry, tiny, bruises on the inner thigh. They say it's a normal effect because the skin on that area is thinner than the other parts. My second RF Thigh session with Ate Joanne. My second session felt really uncomfortable because my thighs are still tender from my first session. It is advisable to do 2 sessions consecutively with 24 hours interval and you do it twice a week for 6 sessions to achieve great results! I was honestly sweating because of discomfort but I wouldn't say that it wasn't bearable. I'd still say that having labor is much painful. No pain, no gain, right?! Both Ate Gina and Ate Joanne are very professional. My schedule is at 2pm and they arrived way too early but wouldn't want to go inside the house until it was treatment time. They have their own service too! Plus points that they carry a portable bed in case you don't want to use your own bed for the treatment. Overall, I felt really satisfied and happy with this experience. 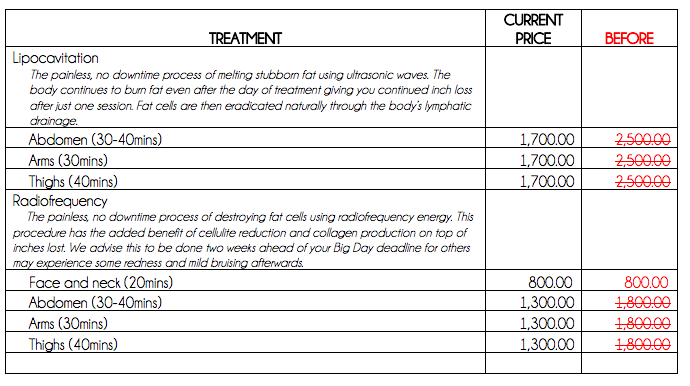 I would definitely invest on this kind of slimming treatment if I have extra on the budget. Both session lasted 40 minutes each and I lost about 2 inches off of my thighs. I don't think I'll be able to loose an inch if I ran up and down our stairs for a day, so that's pretty impressive! 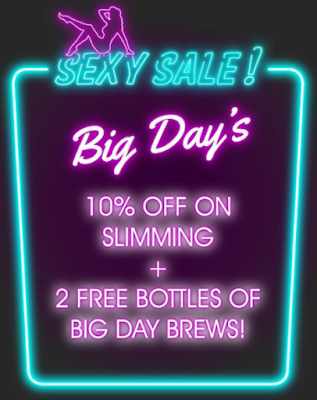 I also got a free meal replacement drink thanks to Big Day Brews a product under Big Day Slim Team. 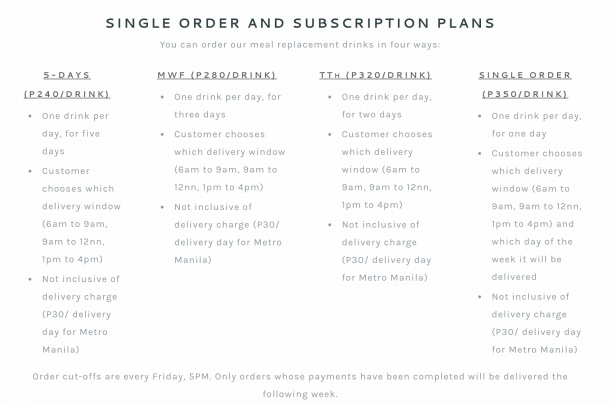 Each meal replacement drink bottle recycled back to us, you make 3 seed donations to our farm in Tanay, Rizal where all crop yield will be given to less-fortunate families in Rizal. A meal replacement is intended as a substitute for a solid food meal. Our drinks have controlled portions of what you’ll need in an average meal such as vitamins, fiber, protein, good carbohydrates and lastly, good, clean calories. Variances in the content of our drinks bring about different effects. Some drinks work as energy boosters while others promote the immune system. These are simply byproducts of what our products are about: losing weight sustainably. The one that I got is Banana Mocha. It's an awesome energy-booster that’s recommended for pre-workouts. Loaded with electrolytes for clean energy to burn with such a yummy taste. 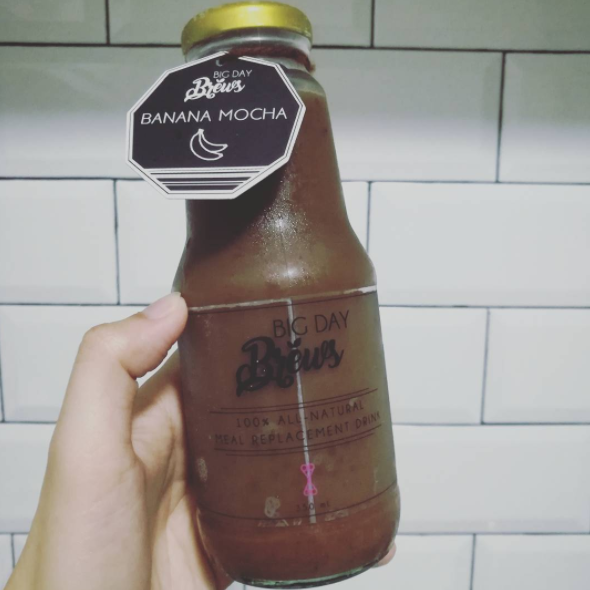 Calories: 423 cal/ 350ml bottle. This September, trim those inches and shed those pounds! From Sept. 1-30, all slimming packages with a minimum of 2 services get an additional 10% off AND we'll throw in 2 days worth of our meal replacement drinks from Big Day Brews for FREE! Vlog post to be uploaded soon! Rookie Mommy PH - 2 inches slimmer than 2 days ago. *Wink! 1 comment on "First time doing RF Thigh Slimming Treatment with Big Day Slim Team"
Thigh slimmimg gives shape to body, this unique way to control your weight and also slimmimg to drop offf the extra fat in the body. It will make you look beautiful for ever.